Parklea Branching Out Growing Together is a carbon saving project funded by the Climate Challenge Fund. We aim to reduce the collective carbon footprint of Parklea and the wider Port Glasgow community through recycling, reducing waste and the re-use and upcycling of materials and textiles. Through our growing together workshops we will share what we learn through our activities to benefit our wider community, particularly hard to reach groups, with the aim to reduce local carbon emissions but also to change behaviours and attitudes towards waste and climate change. The workshops will encourage partcipants to make low carbon food choices, raise awareness of the best ways to avoid food waste, reduce household waste and encourage more re-use recycling. 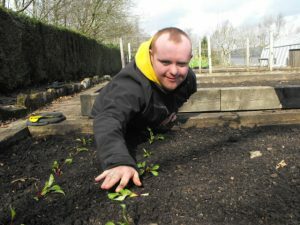 Growing toget her also offers opportunities for people with learning disabilities to gain skills relevant to independent living and encourages greater integration and inclusion. We aim to increase the skills and confidence of marginalised people. 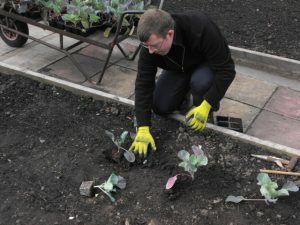 Waste reduction activities can help tackle poverty and gardening activities give access to fresh food, helping to decrease health inequalities. In order to promote greater recycling an re-use we have a working group of volunteers facilitating a regular schedule of activities to recycle paper, glass, card and metal. Working with other local voluntary groups we support participants in upcycling clothing and providing a means to distribute clothes for donation. As part of our community efforts, growing together plans to run twice weekly activity programmes involving local schools. All of these workshops will be open to pupils from both mainstream and ASN schools, being designed to fit in with eco activities present in curriculums. Several of these workshop sessions will also be open up to the wider community and volunteer groups.